Greeting Hagamoto-san! How are you doing today? I`m really happy that you found some time for this small conversation, I know you’re very busy, so I really appreciate it. Thank you for this opportunity to introduce myself to your readership and I apologize in advance if my answers are a bit bland. Well, honestly I was shocked, when I saw how many bands you are a part of. The list is huge. So I must ask where do you find time and energy for all that? What motivates you to create so much music? You naturally gravitate to activities that you enjoy, and since I enjoy making music, I don’t have to make an effort to find time and energy, that’s just the activity on which I naturally spend my time and energy. Enjoyment of making music is its own motivation. You are friends with manyspectacular musicians from around the globe, what gave you the idea of making international bands? Is it hard to do that? I mean that we all have different thoughts and points of view. I bet that sometimes it very hard to find a common solution in music. I want to do bands with my allies regardless of whether they are here or abroad, but coincidentally almost all of my allies are in other countries and so also coincidentally most of my bands are long distance collaborations. My long distance bands have all happened to escape the usual challenges around resolving differences of opinion and making compromises, probably because of the creation process; the drummer sends me drums and I add the rest and that’s the finished product. There isn’t much collaboration because the business of daily life doesn’t allow for multiple iterations, email correspondence makes discussion cumbersome, and the main goal is just to get the release done so each member just trusts the others to fulfill their roles. I know that Japanese culture, history and mythology is very rich and fascinating (especially for the people from Europe and USA) it has a lot of sick and dark moments. Do you think this has had an influence on the Grind scene in your country? Japanese heavy metal, punk, whatever is mainly influenced by British and American music (more generally, anything “western”), not just the sound but also the imagery. That is what is considered standard and that is on what bands here are based. Bands that make a point to use stereotypically Japanese elements are usually doing so in an attempt to appeal to foreign audiences, but among the domestic audience that kind of appeal is considered pretty square. Ironically, people here think that it’s the culture, history and mythology of other countries that is rich and fascinating, and that accounts for the aping of foreign influences that I mentioned at the start of this answer. Let`s talk about live gigs. Do you enjoy being on the stage? And also I can’t avoid asking about your journey to Australia, tell us about that tour too, please. It’s satisfying when a show goes well, but to be honest my performances aren’t that exciting and I’m also not very good at live sound, so I tend to focus on recordings over shows. After a band is gone, the standard version of its music is usually its studio versions, so for the sake of posterity I put more effort into recordings being as good as I can make them. Melbourne was great fun; though I’m not sure how much of an impact I had on the audiences with my lackluster performances, I was very happy to meet the core of local music enthusiasts and see lots of talented bands, and on top of that the city seemed a wonderful place as well. Also I want to specifically mention The Make It Up Club which hosted me at one of the most personally enjoyable shows I’ve ever done. You release your music on your own, why is that? I can`t believe that there are not any labels that want to release your stuff with great pleasure. With my first band I made an honest attempt to generate interest among labels and zines, but we never got any traction and I became discouraged from dealing with other people. At the same time, I was getting indoctrinated in the particular flavor of MRR DIY culture of the day which really took hold with me for whatever reason, so I started my own label and never saw any need to ask anyone for help after that. Of course there is the benefit of making new allies which is one large reason I’ve given a few of my releases over to other people in recent years, but considering only the practicalities of releasing music, there’s not much that other labels can do for me that I can’t do on my own given my current goals. I don’t have any real interest in gore aside from it being a convention of the genre, and when I use it for my bands it’s only because it seems most natural to default to convention. It’s not so simple a matter to be able to successfully introduce non-traditional themes. J-pop as I guess you’re imagining it in the form of idol groups is mainly liked by nerds, and I don’t have any interest in nerd culture so I also don’t have any interest in idol groups. There is one band called Necronomidol that sometimes plays underground metal shows here though; a well known scene figure who likes idol groups books them on some of his shows. Could you tell our readers about each of your active projects? Most of these are on bandcamp at discosalpacino.bandcamp.com along with a few other things I’ve done. Hagamoto-san what is your goal, what do you want to achieve with your nasty and noisy art? I hope that my music can contribute to people’s happiness. I want the satisfaction of knowing that I’ve been able to positively impact people’s lives. When someone tells me they enjoy my music, I feel like I’m achieving my goal at least in some small part. I know this sounds glib especially in the context of this interview but it’s sincere nonetheless. Ok let`s turn on the fantasy dial for a moment. If there was a kaiju, Hagamoto, (a huge one) do you think it could handle Godzilla in a fight? I’m not much of a fighter so it might be tough regardless of my size. Speaking of Godzilla though, if you as a band foreign to Japan are considering merchandise for a Japan tour, leave off the Godzilla references if you want the merchandise to sell. Also to avoid are samurais, geishas, Japanese text, swords, etc. Audiences here are fetishizing your band’s non-Japanese-ness; re-introducing Japanese elements just negates that fetishizing. Bands tend to forget that the fetishizing is what translates into audience interest and into sales. Even if you have a moral objection to encouraging the audience’s fetishization though, you should still leave off aforementioned elements since their inclusion amounts to fetishization on your part and in any case they’re certainly not ingratiating you with anyone. In your opinion, which Japanese Grind/Noise bands best represent your country? I am not at all knowledgeable enough to answer this with any degree of authority, but to give a minimally informed answer about grind, it would probably be the bands with whom everyone is already familiar and whose members have been contributing since the 80s. I’m not going to name drop for fear of looking like I’m juiced in with people with whom I am not…but anyway it’s just the usual names. Noise I know almost nothing about, but of course there are some recent and well known bands like Sete Star and Cunts and I guess they are among those acting as representatives of the current garbage scene here. And that`s all, sayonara Hagamoto-san, thank you for this warm conversation. Thank you so much for your continued support. 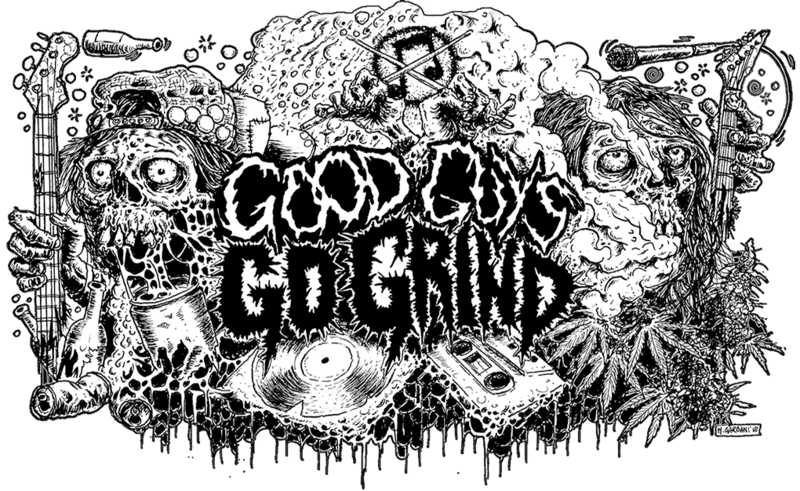 Stay brutal and enjoy grind. Previous Previous post: Hot proposition from Selfmadegod rec! Next Next post: Good news from Grindfather prod! Split tape Nucleus / Meatus / Necrotic Eruption is out! Vomitoma - Insufferable Insect Ingurgitation! Fight it Out - Most Hated LP is out! First looks at Grossel / Weedeous Mincer split tape! Out now at Diablos Records! Coming soon at Grindfather prod! Collection tape of Cave State!